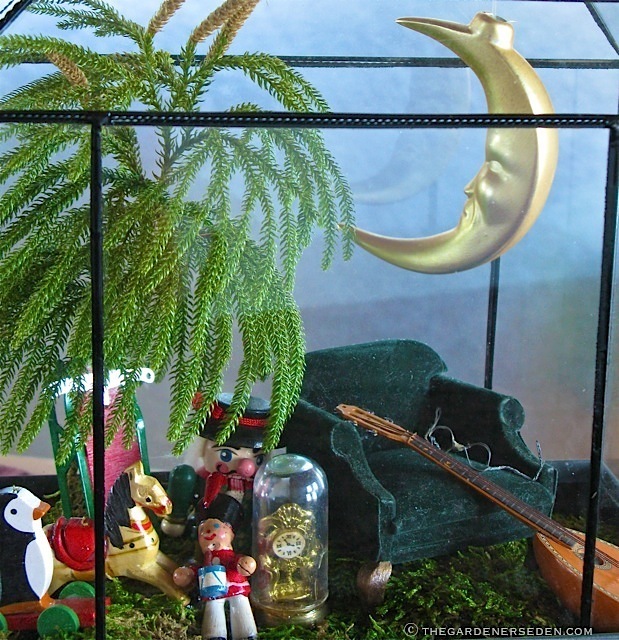 Nutcracker Suite Terrarium: H. Potter Wardian Case Filled with Lycopodium obscurum “Tree”, Sheet Moss “Carpet” and Miniatures. Terrarium vignette designed and created by Michaela at TGE. When it comes to holiday presents, I think there’s nothing quite as memorable and meaningful as a beautiful homemade gift. And a living gift, like a terrarium, keeps giving all year long. Terrariums are a great way to introduce children to the magic of horticulture, and they also make great gifts for city-dwellers –particularly plant-lovers residing in tiny apartments or working in sterile-looking cubicles. These gorgeous, easy-care gardens-beneath-glass are also wonderful gifts for those with physical limitations, disabilities or limited time. Beautiful terrariums can be crafted on any budget, and containers and plants can be easily found online or in garden centers. If you like, you can even put together a kit of materials and box them up as a project to share with the recipient (or send one off by mail with a gift certificate to a local garden center or online plant retailer). 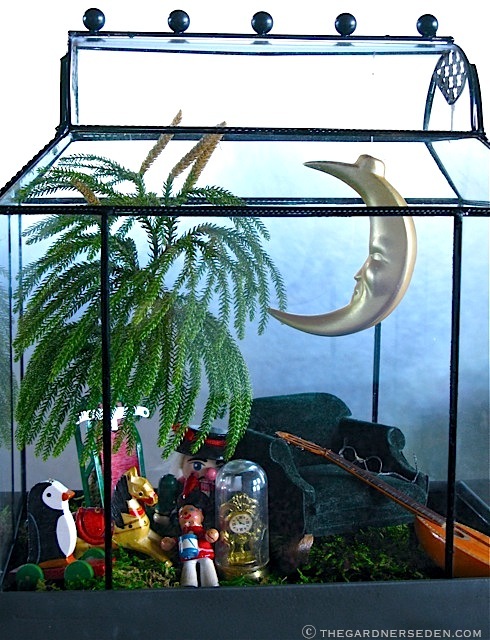 A holiday terrarium can be decorated with miniatures —like the one above— before giving, or to celebrate the season and add a bit of humor or beauty to your home. 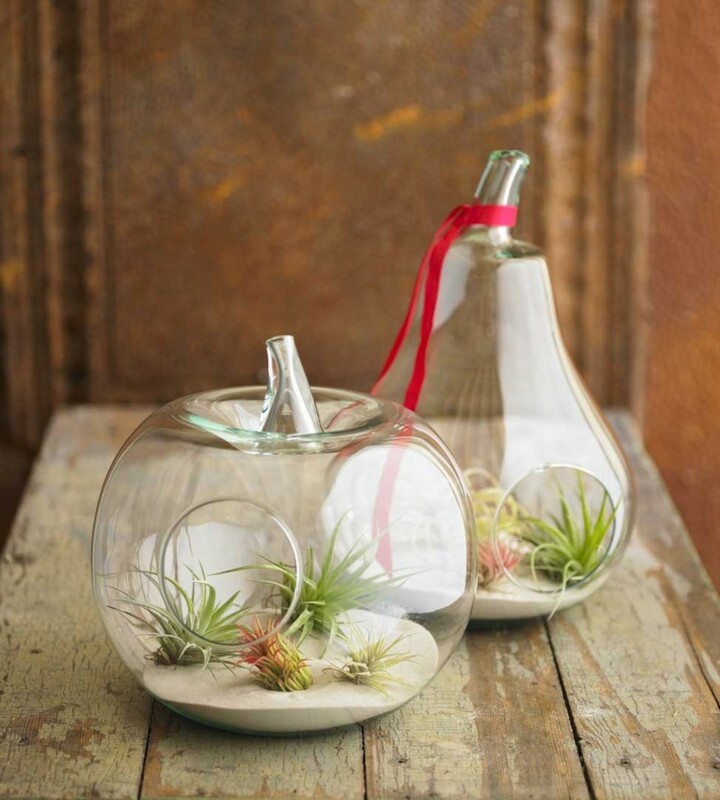 Handblown glass orbs, tiny figurines or holiday ornaments all make fascinating additions to terrariums. 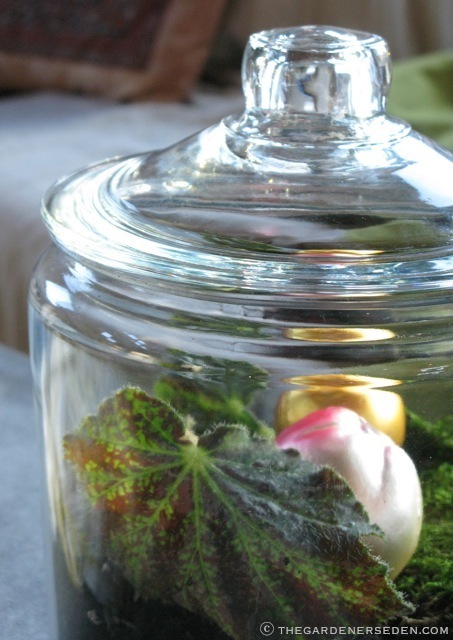 For basic instructions on how to create a terrarium, click here to visit a tutorial post from last year. 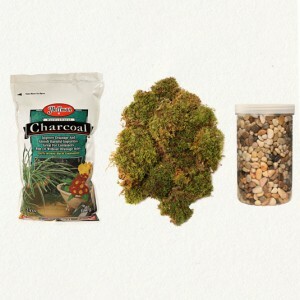 If you are constructing a permanent terrarium, be sure to use horticultural charcoal (available through many garden centers or online shops – see links below). If you are creating a temporary holiday display terrarium (particularly if the plants are pre-potted), you can skip this step. Horticultural charcoal will help to keep your terrarium fresh. 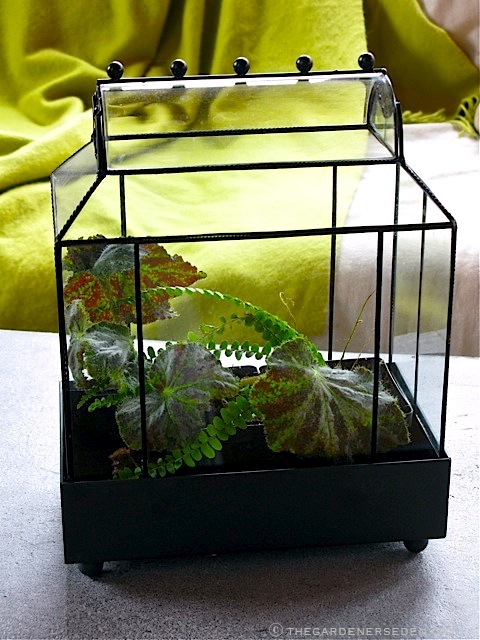 Below are some of my recent terrarium projects and some great online resources. You will also find more ideas by visiting the Indoor Eden page linked here, and on the left-hand side bar. 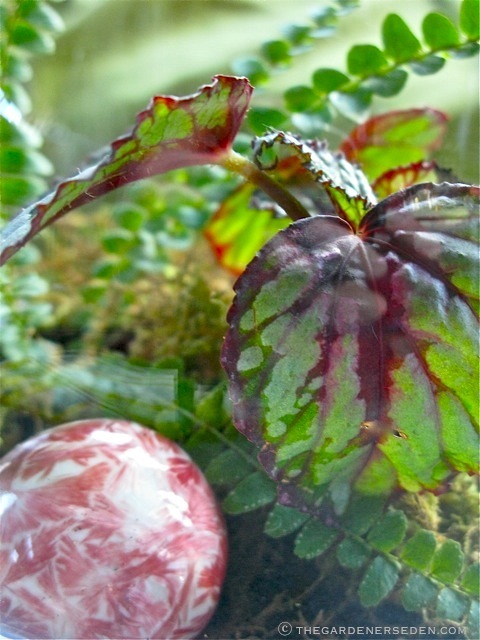 Glass Jar with Begonia ‘Tangalooma’, Sheet Moss and Colorful Glass Fruit Ornaments and Bird. Designed and created by Michaela at TGE. Begonia ‘Trade Winds’ with Nephrolepis cordifolia ‘Duffii’ (Lemon button fern/Pigmy sword fern) Sphagnum moss and Ceramic Ornament. Designed and created by Michaela at TGE. Begonia ‘Tangalooma’ and Ornaments. Designed and created by Michaela at TGE. Nephrolepis cordifolia ‘Duffii’ and Begonia ‘Trade Winds’ with Sphagnum moss and Ceramic Ornament in an Apothecary Jar. Designed and created by Michaela at TGE. 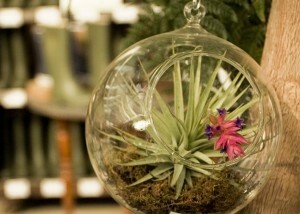 Terrain has some of the most beautiful and imaginative terrarium containers (and supplies) I have ever seen. 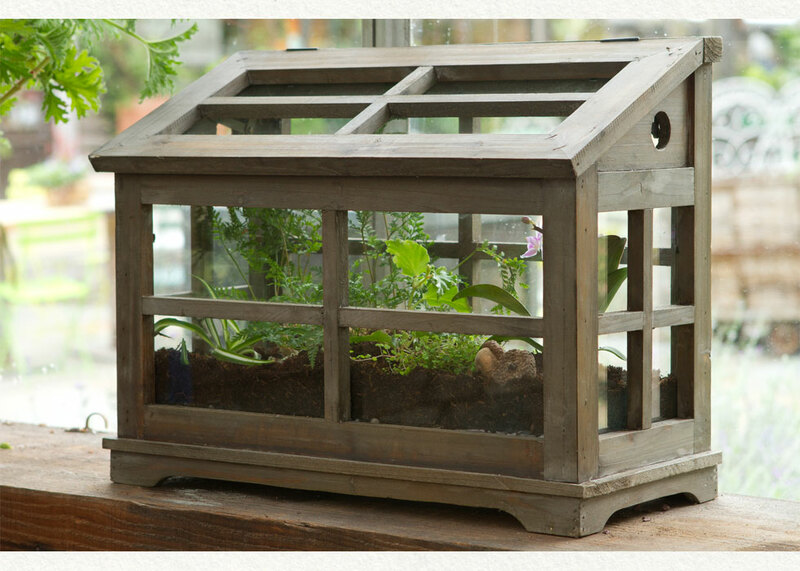 This beautiful orchid house terrarium ($118), is made of wood and glass, with a liftable lid, and would make a dream gift for any gardener. I really want this one, and I am sitting on my fingers. It’s definitely on my Christmas list (hear that Santa?). The gorgeous wardian case at the top of this post is from H. Potter. 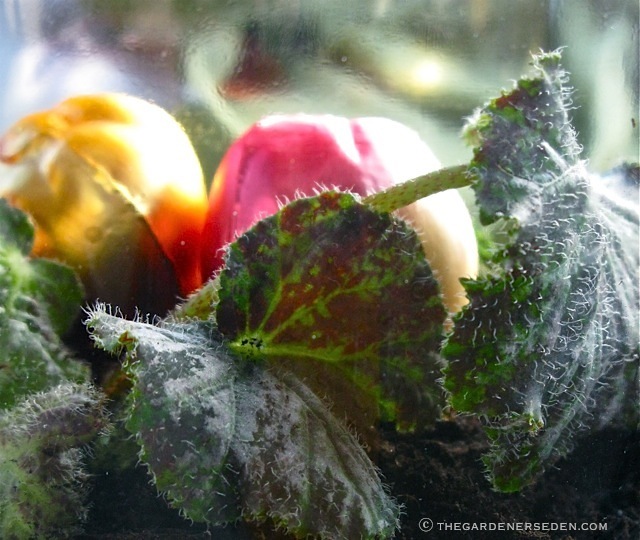 The company also has a great blog with terrarium-growing tips from author Tovah Martin. If you love terrariums as much as I do, I highly recommend checking it out. VivaTerra has gorgeous terrarium containers, including this hanging apple and pear shaped set made from glass. They also sell pre-filled terrarium containers for gift-giving (great if you are mailing a gift to someone far away). 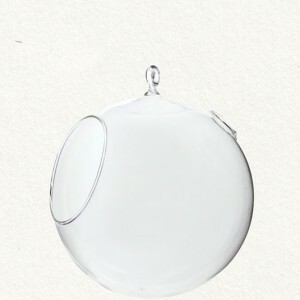 Terrain’s Terrarium Hanging Glass Orb $24, Would Make a Beautiful Container for Plants, and a Great Homemade Gift. See How They Have Filled One Below (Photos From Terrain Online). 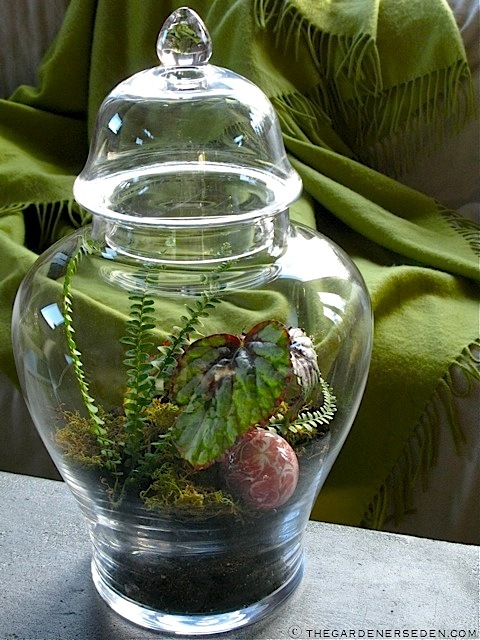 Terrain Terrarium Hanging Glass Orb Can Be Filled Any Way You Like. A Supply Kit Like the One Below will Provide Enough Material for Several Small Containers. 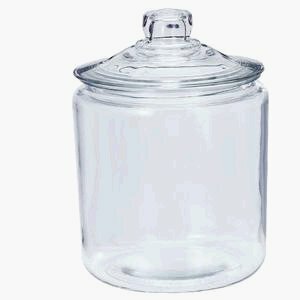 Anchor Hocking 1 Gallon Jar with Lid ($9.99 from Amazon.com): This is the jar I most frequently use for beginner terrarium projects. It’s inexpensive, reusable and perfect for kids. Although it is glass, it’s heavy and not fragile. The gorgeous cloche below is more appropriate for a teenager or adult. 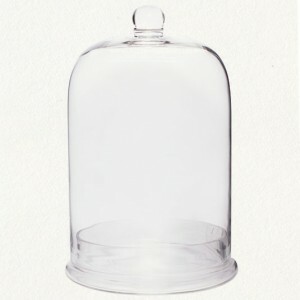 Glass Cloche with Base $58 from Terrain: This is an elegant choice for an orchid or a container of taller terrarium plants. 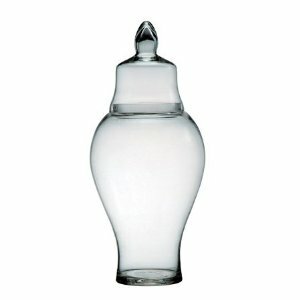 Amazon.com has an amazing variety of apothecary jars and glass containers. 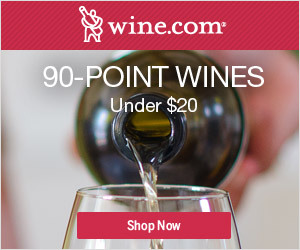 You can find almost anything you are looking for, from the budget-conscious to the extravagant. 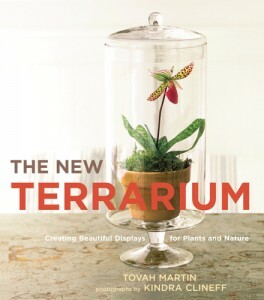 Tovah Martin’s book The New Terrarium ($16.50 at Amazon.com) contains both inspirational projects and practical advice on how to create and care for a terrarium. H. Potter Wardian Case with Begonia ‘Tangalooma’ and Nephrolepis cordifolia ‘Duffii’. Designed and created by Michaela at TGE. 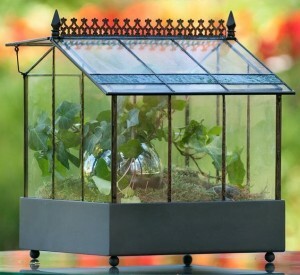 All terrarium plants (with product-links excepted) are from The Old Schoolhouse Plantery. 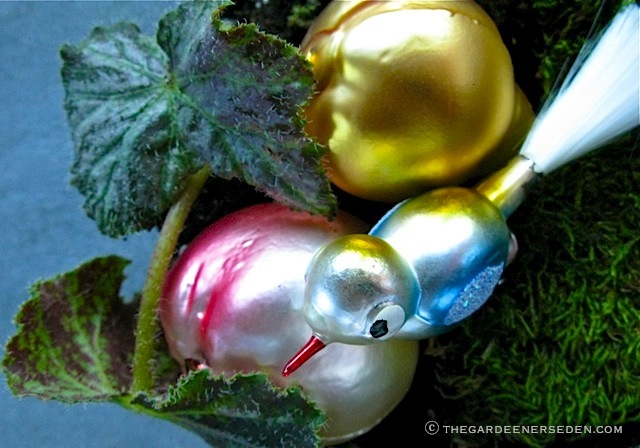 You are currently browsing entries tagged with Terrarium Making Supplies and Resources at The Gardener's Eden.